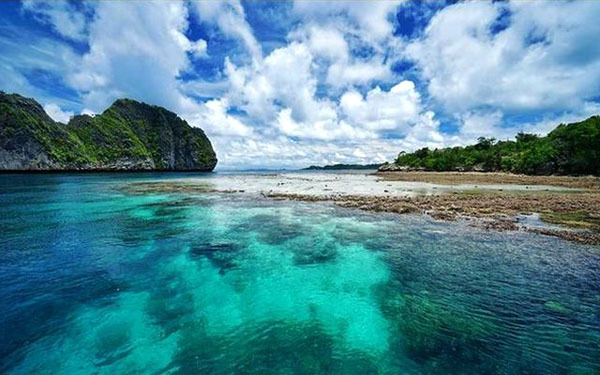 No one is allowed to overlook the beauty of Raja Ampat Regency. As part of Indonesia, the archipelago offers mesmerizing islands and their lures. For instance, there is Misool Island. It is one of the greatest islands of Raja Ampat and it is the home of a pristine beach called Gamfi. Due to its charm, the beach is suitable for numerous fun activities like sightseeing, playing water, photography, swimming, and much more. In a nutshell, it is a primary checkpoint for those who want to explore all parts of Misool Island. It is not difficult to describe Gamfi Beach. The most noticeable part is the calm water, as it is protected by several karsts. The big waves barely reach the shoreline, so people can swim in the water in a safe manner. Apart from the safety, the sea water is also beautiful! It is both clear and warm, as well. When it comes to the beach, the sand is white with soft texture. No trash is seen in the location, as people take a good care of the environment. Tourists are not an exception. The beach doesn’t have much sand, so it is not suitable for sunbathing. However, the tropical heat of the sun may satisfy all visitors. This explains why some foreigners come to Gamfi Beach to enjoy such warm atmosphere. They also want to get in the water and enjoy its nautical beauty. After all, both swimming and snorkeling are popular in Gamfi. As for the tip, tourists should visit the beach during the off-season. It is between May and September when there are not many visitors. A peaceful nuance is everyone’s favorite, isn’t it? What’s more? Once people enjoy good times in the beach, it is time to do other fun activities. For example, they can try some local foods like Sate Ulat Sagu and Papeda. These foods are available in nearby eateries, so tourists should have prepared some money beforehand. As an alternative, they can visit a nearby village and get along with villagers. For lucky people, the locals may invite them to dinner. It also becomes an opportunity to learn their culture! Before visiting Gamfi Beach, it is important to learn several things. For example, tourists should know how to identify currents. Some parts of the water are considered dangerous for swimming, after all. Next, it is related to the foods. For those who want to spend hours at the beach, it is better to pack lunches prior to visiting the beach. This way, they don’t need to look for any eateries later. As mentioned before, Gamfi Beach is located in Misool Island. How can tourists get there? For those coming from Jakarta, they can take advantage of an airplane and the destination is Domine Eduard Osok Airport. It is located in Sorong City, actually. From there, the next destination is Sorong Port, where tourists can take a speedboat to their final destination.